Grand constitutional questions in this country aren’t settled until the Supreme Court has its say, either by affirming or reversing the rulings of lower-court judges or simply by declining to hear challenges to those rulings. So it’s too early to conclude definitively that North Carolina’s Republican-controlled General Assembly has set a sorry standard leading to a national crackdown on over-the-top partisan gerrymandering of election districts. That’s a call surely destined to be made by the justices in Washington. But the bombshell Jan. 9 decision  by three Greensboro-based federal judges upheld every claim that the constitutional rights of a large swath of North Carolina voters have been violated. It thereby broke new ground in establishing that North Carolina’s 13 congressional districts were drawn in keeping with a Republican strategy so brazenly partisan that it shouldn’t be tolerated. The North Carolina Council of Churches, which resolutely has pushed for fair elections and the right of all citizens to cast meaningful votes as being vital to a just society, salutes this outcome as hopefully marking the beginning of the end to one of our political system’s worst kind of abuses. The ruling requires new maps for the districts to be enacted no later than Jan. 24 – a timetable meant to allow the state’s congressional delegation to be chosen this year from districts that pass the constitutional smell test. Legislators promptly announced they would ask the Supreme Court for a stay. Since the justices already are considering other challenges to partisan gerrymandering from Wisconsin and Maryland (challenges targeting Republicans and Democrats, respectively), a stay might seem par for the course. Except that the facts out of North Carolina are so compelling – and so damning. In a nutshell, top Republican legislators who oversaw the 2016 redistricting – which also was conducted under court order after maps drawn in 2011 were thrown out as racial gerrymanders – hung themselves out to dry. 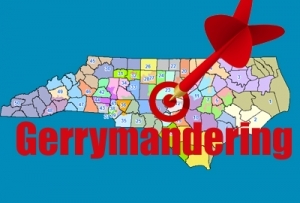 The new ruling traces the tumultuous history of recent North Carolina redistricting efforts, all carried out as required to adjust voting district boundaries in line with population changes. The maps drawn in 2011, after the once-every-decade census, allowed the GOP in 2014 to capture 10 of the 13 congressional seats, or 77 percent, while attracting only 54 percent of the statewide vote. When those maps were invalidated, Republican leaders were intent on maintaining the same lopsided split among North Carolina’s members of Congress and thus helping to sustain the party’s margin of control in the U.S. House. Sure enough, in the 2016 elections, 10 Republicans were elected vs. three Democrats, while 53 percent of the state’s voters backed GOP congressional candidates. Senate redistricting chair Bob Rucho of Matthews (now retired from the Senate and sitting on the UNC Board of Governors) and his House counterpart, Rep. David Lewis of Dunn, worked with national consultant Thomas Hofeller to develop maps that allocated voters not overtly by race but by partisan loyalties, as gauged by past election results in different areas. The process took advantage of today’s computerized mapping capabilities that can set district lines virtually house by house. Lewis openly acknowledged that partisan gerrymandering was taking place and Rucho said he saw nothing wrong with their approach. Lewis went so far as to say the reason the maps were designed to secure 10 Republican wins was that he didn’t see how to draw them so the delegation would be split 11-2. The strategy banked on the Supreme Court’s willingness to accept a level of conspicuous partisanship in the drawing of voting district boundaries and its hesitance to say when that acceptable level has been exceeded. Now, it’s clear the legislators were pressing their luck. Sitting as a U.S. District Court panel, Judges James Wynn, Earl Britt and William Osteen (two Democratic appointees and one Republican) delivered an opinion that seems almost taken aback at how determined the Republicans were to marginalize Democratic voters. For a redistricting plan to hold up in court, certain standards are supposed to be met: more or less equal population among the districts, geographic compactness, maintaining whole counties and precincts to the extent possible, racial equity. The judges found that Hofeller had drawn his maps intended to boost Republicans before even receiving any instructions about other criteria. Legislators went through the motions of soliciting public comment, but the maps were already done. After swatting aside arguments that the plaintiffs – including Common Cause and the League of Women Voters, along with individual voters from across the state – lacked standing to sue, the judges proceeded essentially to throw the book at Lewis, Rucho & Co. The basic gerrymandering mechanism was to draw a handful of districts – three of them – in which Democratic voters would easily elect a Democratic congressional candidate, a technique known as packing. Meanwhile, other Democratic-leaning areas would be parceled out via “cracking” into the remaining 10 districts where Republicans were expected to win. Democratic votes would be devalued because on the whole, they’d have less influence in shaping the delegation than their numbers suggested they should have. And Republican lawmakers could avoid accountability to a sizeable portion of the electorate. It’s a dynamic that helps explain why, for example, the Republican U.S. House could be so dismissive of public opposition to big tax cuts favoring corporations and the super-wealthy that also threaten programs important to ordinary families. According to the panel of judges, the plaintiffs proved violations of their right under the 14th Amendment to equal protection of the laws because of the politically motivated discrimination they faced. “When viewed in totality, we find Plaintiffs’ evidence more than sufficient to prove that the 2016 Plan has discriminated, and will continue to discriminate, against voters who support non-Republican candidates,” the panel wrote. Further, they said the maps were an unconstitutional abuse of a state’s authority to set the “Times, Places and Manners” of congressional elections. What that finding boiled down to was that the legislature, by drawing districts predetermined to yield a pro-Republican outcome, improperly sought to skew elections that are supposed to reflect fairly the popular will. Legislators such as Rucho and Lewis, backed by their Republican colleagues down the line, seemed cocksure in their certainty that they could get away with their redistricting scheme, as discriminatory as it was. Wynn, Britt and Osteen have laid down a persuasive set of conclusions that could, and should, convince the Supreme Court that our legislature’s Republican majority was more than willing to abuse constitutional principles to hold power and advance its party’s unfortunate agenda. We have to hope that when the dust settles, those conclusions will have been stitched into the law of the land.